Getting your Amazon store set up properly is important. But what happens once it goes live? How you manage your store on a daily basis is crucial to your success. 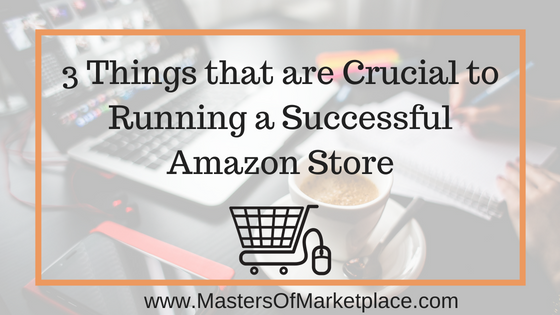 There are 3 management items that you absolutely need to be diligent about on a continuous basis to ensure your store is successful and that Amazon won’t shut you down. 1. Fast Response Time: You must respond to customer service emails within 24 hours. Amazon really doesn’t like when their customers have to wait for you, so email them back as quickly as you possibly can so that Amazon, your customers and your potential customers will all be happy. The easiest way to ensure you can always respond to your customers quickly is to set up your notifications so that you get an email sent to you every time you receive a customer inquiry. So, make sure those notifications are all set up, and always respond within 24 hours. 2. No Late Shipments: Always make sure that all of your shipments go out on time. I highly recommend using Amazon (Fulfillment by Amazon, abbreviated FBA) to fulfill your orders, but there are some situations where it makes sense to have third party or seller-fulfilled options for Amazon customers. When seller-fulfilled orders come in, be sure they get shipped by the correct date so the customer receives their purchase between the expected ship date range. If your late shipment rate goes over 4%, Amazon will flag your account and your store could be shut down. It is crucial to ship orders on time, every time. 3. Maintaining and Managing Customer Feedback: Strive to respond to any feedback that you receive. It’s extremely important to resolve any negative issues, but try to respond to the positive reviews too. This lets Amazon and your customers know that you are being proactive and that you take customer feedback seriously. Depending on how many customer complaints you get in a certain period of time, Amazon can audit and potentially shut down your account. In Amazon’s eyes, customer feedback is huge. As a seller you want to make sure that your customers are happy. There are many things you can do as a seller or store manager to increase sales and get your product in front of more customers. But above and beyond those things, it is absolutely crucial that you take care of these 3 basic items on a regular basis first, and stay as diligent as possible. Amazon can shut you down for failing to adhere to any one of these 3 guidelines, which is why they are so important. Respond to customer inquiries within 24 hours. Make sure any seller-fulfilled orders are sent on time. Respond to customer feedback, positive or negative, and resolve any issues in a timely manner. If you can keep up with these 3 simple items on a regular basis, you and your store will already be ahead of the curve in Amazon’s eyes. Interested in Marketing Your Amazon Skills as a Service? I own a consulting agency that helps businesses set up and launch their Amazon stores and I also teach this as a skill, so if you want to learn to sell on Amazon or how you can offer it as a service to others, I can help. Maybe you’re a VA or a stay-at-home mom looking to make some extra money. That’s how I started and now I make a very good living as an Amazon consultant offering services to business owners who sometimes don’t quite get it (and may not really want to), or just don’t have the time. So, they often choose to hire it out to someone who already knows how to sell on Amazon. Masters of Marketplace is my online platform where I teach people how to sell on Amazon, and I’d love to see you there! Whether it’s for yourself, your boss, or your clients, I highly recommend you come check out the site, take a look around and see all the different opportunities there are to make money on Amazon.